The monster storm bearing down on the northeast today (Feb. 8) looks just as scary from space, as revealed in this new photo taken by a satellite in orbit around Earth. The National Oceanic and Atmospheric Administration (NOAA)'s GOES-13 satellite captured the image at 9:01 a.m. EST, showing a powerful nor'easter coming together over the eastern seabord of the United States. Two low pressure systems can be seen merging over the coast to create a storm expected to drop between 2 to 3 feet of snow in parts of New England, according to the National Weather Service. 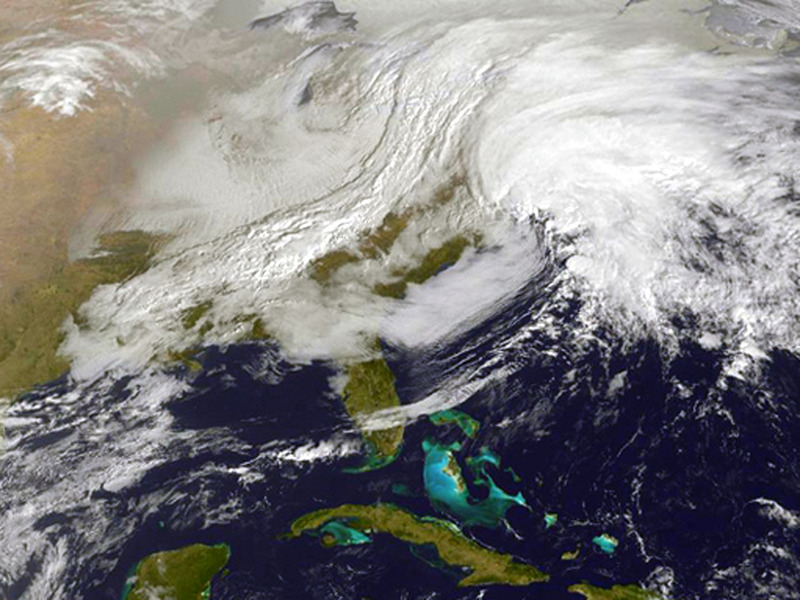 At the time of the photo, the western frontal system stretched from Canada through the Ohio and Tennessee valleys and into the Gulf of Mexico, while the hook-shaped eastern system hung over the Atlantic Ocean, east of Virginia. The storm is forecasted to produce a blizzard over New York City and the northern mid-Atlantic late Friday and into early Saturday. If the two fronts merge very quickly, a significant amount of snow could fall.